Keep mildew away with Mildew Protectant Spray! 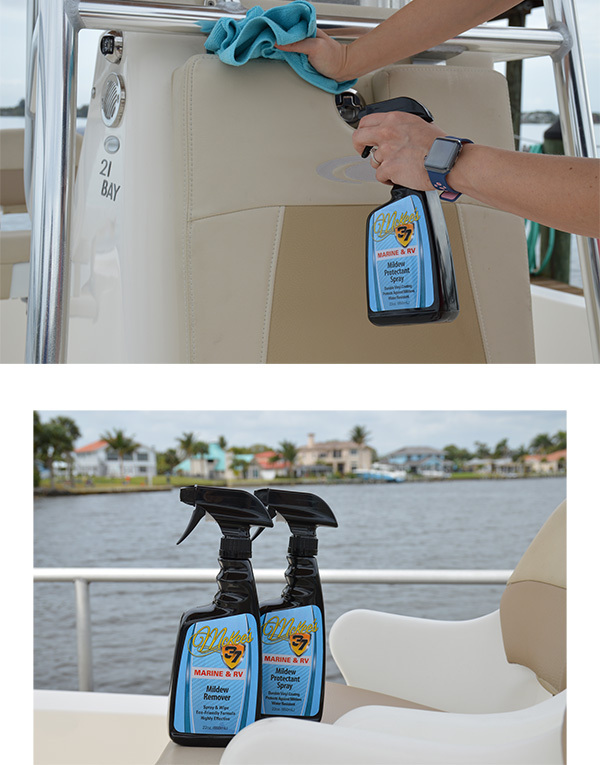 McKee’s 37 Marine & RV Mildew Protectant Spray keeps your vinyl surfaces free from mildew. This unique formula blankets the surface with an advanced polymer coating, forming a shield of protection that prohibits mold and mildew growth. McKee’s 37 Mildew Protectant Spray is ideal for use on vinyl seat cushions, rubber bumpers, and other outdoor vinyl surfaces. Vinyl and rubber surfaces are built to be tough — that’s why they’re so frequently found on boats and camping gear — but that doesn’t mean they can be neglected. Without proper care, these surfaces will wind up plagued by mold and mildew, leaving you buying expensive replacements. But that doesn’t have to be the case! McKee’s 37 Mildew Protectant Spray is the perfect, easy-to-use way to keep mold and mildew at bay! McKee’s 37 Mildew Protectant Spray is more than just a dressing. It creates an impermeable layer of protection on treated surfaces to guard against the damaging effects of sunscreen lotion, sweat, salt, UV Rays, and other common contaminants. It dries to the touch, leaving a natural low-gloss sheen that dries to the touch, keeping the surface looking and feeling like new. Create an impermeable layer of protection on treated surfaces to guard against the damaging effects of sunscreen lotion, sweat, salt, UV Rays, and other common contaminants with McKee's 37 Marine & RV Mildew Protectant Spray! 1. Thoroughly clean surface first using McKee’s 37 Mildew Remover or All Purpose Surface Cleaner. 2. Spray Mildew Protectant Spray onto an applicator sponge and apply a uniform coating on vinyl surfaces. 3. Allow coating to bond for 2-3 minutes, then gently remove excess using a clean, soft microfiber towel. NOTE: DO NOT USE ON STEERING WHEELS OR UNDERFOOT SURFACES. McKee's 37 Marine & RV Mildew RemoverMcKee’s 37 Marine & RV Water-Resistant Vinyl ProtectantMcKee’s 37 Marine & RV Gloss Enhancing Final PolishMcKee's 37 Marine & RV Hydro Pearl Sio2 CoatingMcKee's 37 Marine & RV Final Step Detail WaxMcKee's 37 Marine & RV All-In-One Fabric & Vinyl CleanerMcKee's 37 Marine & RV Carnauba Wash & WaxMcKee’s 37 Marine & RV Heavy Duty Cleaner WaxMcKee’s 37 Marine & RV Repel Glass & Plastic CleanerMcKee’s 37 Marine & RV All Purpose Surface CleanerMcKee’s 37 Marine & RV Bug Remover & Wax RestorerMcKee’s 37 Marine & RV Vinyl Decal & Graphic RestorerMcKee’s 37 Marine & RV Heavy Cut Oxidation RemoverMcKee’s 37 Marine & RV Carnauba Sealant WaxMcKee’s 37 Marine & RV One-Step Polish & SealantMcKee’s 37 Marine & RV Repel Glass & Plastic Cleaner 128 oz.McKee's 37 Marine & RV Final Step Detail Wax 128 oz.McKee's 37 Marine & RV Carnauba Wash & Wax 128 oz.McKee's 37 Marine & RV All Purpose Surface CleanerMcKee’s 37 Marine & RV Bug Remover & Wax Restorer 128 oz.